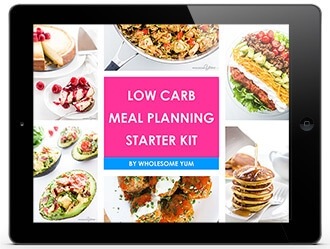 FREE LOW CARB RECIPES E-BOOK! I may have gotten ahead of myself earlier this week. How did I post a leftover turkey recipe before I even shared my favorite Thanksgiving recipe for the year? Time to fix that. 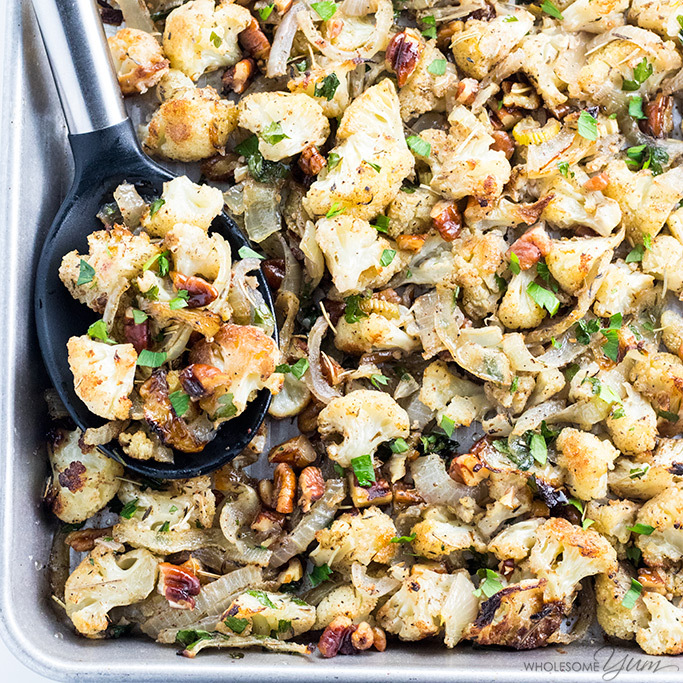 And, I see no better way to do it than with some amazing, low carb, paleo cauliflower stuffing. 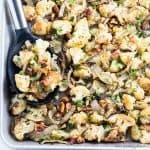 This cauliflower stuffing is probably my favorite healthy makeover when it comes to low carb Thanksgiving side dishes. That’s saying a lot! I’ve accumulated quite a few holiday recipes already, and really do love so many of them. Of course, you’ll still want to make the other classics. Those would be cranberry sauce, green bean casserole, and (low carb) sweet potato casserole – obviously. Low carb stuffing was the logical choice for the next one to recreate. Stuffing has never been my absolute favorite holiday dish, though. I was surprised to find that the cauliflower stuffing turned out to rival the others as the best! That, right there, is a reason to try it. 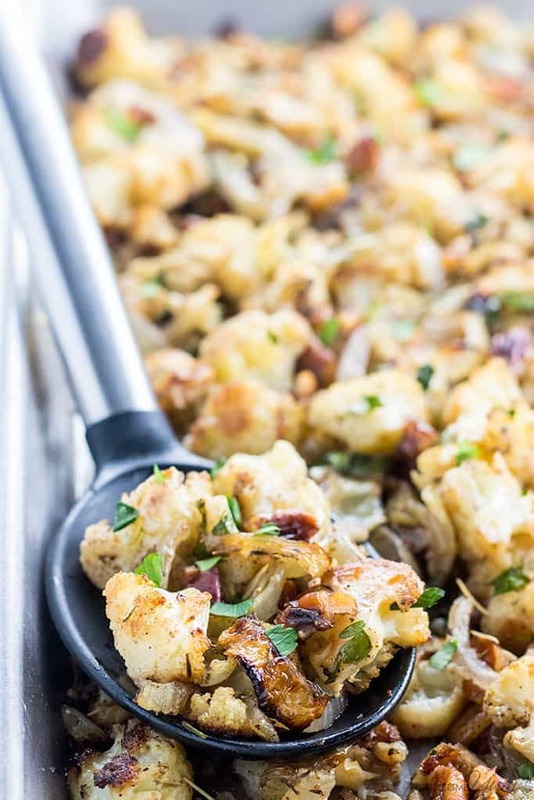 Well, cauliflower has stood in for carbs plenty of other times, so why not with paleo stuffing? 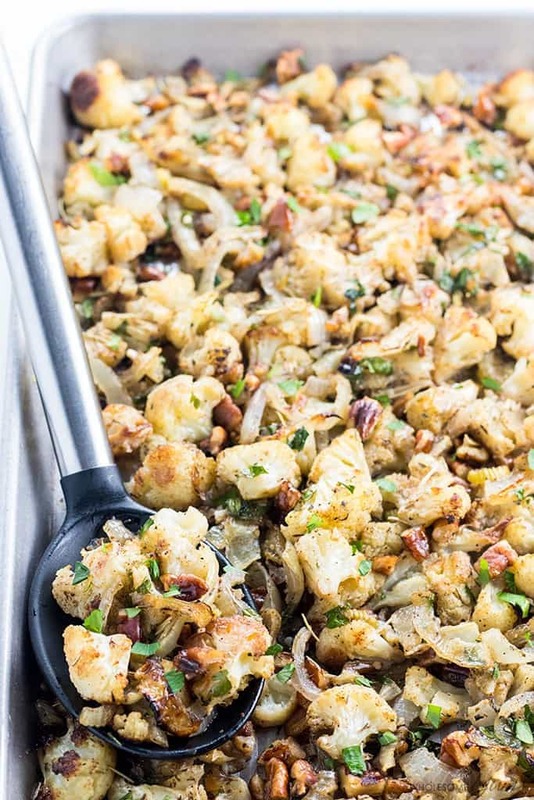 Of course you need to like roasted cauliflower to enjoy it, but it still has all the things you want in great stuffing. If you really think about it, the main aspect that makes the best stuffing – low carb or not – is the spices. Thyme, sage, parsley, and poultry seasoning are most common. I used them all! Feel free to customize them if there are others you like. Other than that, for the best low carb stuffing, you just need something to soak up the flavor. And of course, it has to feel like comfort food. A cauliflower stuffing fits well in both departments! Is it the same as stuffing made with bread? No, of course not. But, it has the same spices and delicious add-ins that you’d expect, it’s nice and soft, and it totally has that comfort factor. 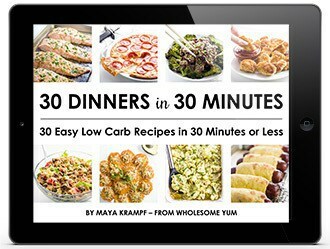 How do you make the best low carb paleo stuffing – especially if you’re super busy like I am? Do it in the oven! And, do it at high temperature to make it quick. If you’re like me, you’re probably making multiple things for the holidays. The last thing I want is to spend a ton of time on any one dish. Making keto stuffing on the stove would require constant supervision. For less work and maximum time savings, the oven is the way to go. This high-temp oven method is the fastest and still allows you to make something else in parallel. The total prep time takes only ten minutes! Otherwise, it’s completely hands off. I never thought this simple twist on roasted veggies would make an amazing paleo stuffing, but it does! 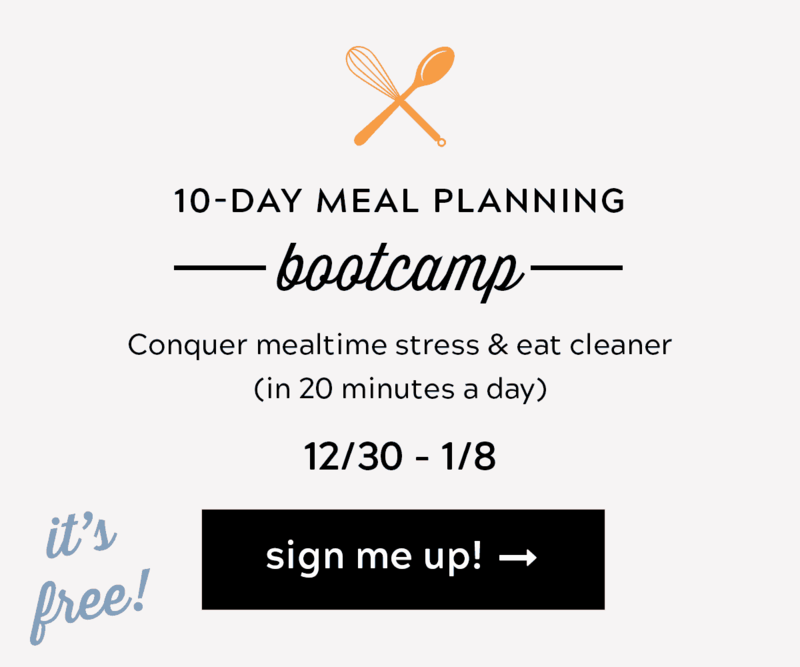 It’s actually so easy that I might make it more often, even outside of the holiday season. Believe it or not, it’s simple enough even for a busy weeknight. Adding the parsley and pecans toward the end only takes a minute. That way, they won’t burn. The final result is a super soft, low carb stuffing, with loads of flavor from the caramelized onions and toasted pecans for crunch. I think I’d actually rather have this than a bread version. If you like your cauliflower more crisp, simply use larger florets. Another option is to pre-saute the onions and then reduce the total oven time. That’s more work, so I prefer the oven only. And, I think the soft cauliflower texture is more reminiscent of traditional stuffing, anyway. Some people may argue that this should be called low carb dressing, because it’s cooked separately. To me that sounds a little strange, because I’ve always associated the word dressing with salad dressing, not Thanksgiving sides. I still maintain that it’s keto stuffing. But hey, call it whatever you’d like! By the way, don’t feel like you have to limit this dish to just Thanksgiving. It makes a delicious side at any time of year. It’s also delicious for other get-togethers with another comforting main dish, like this paleo pot roast from Noshtastic. For Thanksgiving, you can stuff this into a turkey if you want to. You’ll need to cook it first using the same instructions below, then stuff the bird with it. It will become extremely soft as it cooks more inside the turkey, so make sure that’s your thing before attempting. The original version is intended to be served alongside the turkey, instead of inside it. That’s less effort than stuffing a turkey, fewer steps, and still so flavorful!